"This is the truth," Hazel Grace Lancaster (Shailene Woodley), protagonist of "The Fault in Our Stars" declares at the film's onset, an impressive shot across the teenybopper flick bow. I mean, it takes an awful lot of chutzpah to begin your own Y.A., disease-of-the-week weepie by having the protagonist call out in voiceover every other Y.A., disease-of-the-week weepie for being piles of phony and manipulative you-know-what. But you know what? In spite of its numerous melodramatic machinations it still somehow comes across grounded in a tenable reality. A teenager with terminal thyroid cancer, Hazel meets Augustus Waters (Ansel Elgort), who has lost his leg from bone cancer, at a patient support group. He comes equipped with a leather jacket which would seem to suggest he is the bad boy of the cancer patient support group, but that leather jacket is merely a misdirection. In fact, he is an incredibly gentlemanly complete sentence talker who may as well be riding in on a noble steed seeing as how he says things like "I am in love with you, and I know that love is just a shout into the void, and that oblivion is inevitable.." Yet he's not just there to "save" her. In fact, the film does the niftiest little shift midway through where his invincibility gives way to vulnerability and instead of him being there for her, she is there for him. Isn't that love? That give and take? That both for one and one for both? Yes, yes, yes. They're kids. I'm aware. "What do they know about love?!" demand all the stone-hearted fogeys who conveniently forgot what it was like to be kids and in that specific sort of love. But what is so ingenius about "The Fault in Our Stars" is that it recognizes how kids are always trying to graduate early to adulthood. Consider the sequence in which the two dress up and go out for a fancypants dinner. There is something terrifically beautiful and terrifying in it because it is overcome with the realization that their respective sicknesses might not allow them to graduate to adulthood and so they'll just go ahead and damn well make like grown-ups while they still can. That dinner involves the film's greatest leap in which Hazel and Augustus take a trip to Amsterdam to meet her favorite book's author, a Salinger-esque recluse played by an actor who is so perfect for the part I refuse to spoil it for anyone who hasn't seen it. The objective of this meeting is for her to learn what happened to the novel's characters after the ending since he has never written a follow-up, a fairly obvious device to illustrate that Great Unknown awaiting each every one of us. Still, it works, and not only because the supremely crotchety author sort of (unintentionally?) directs invective at the type of Y.A. hoo-ha he's in, but because it modulates this dream come true and re-filters it through something harsher. This nimble striking of tone can be traced to its lead actress. Like Molly Ringwald before her, the stately ingenue of the 80's who means so much to those of a certain age, Shailene Woodley has often conveyed a wisdom beyond the years of her roles - even in the remarkable "The Descendants" were she was both wise and dumb - and her turn as Hazel is numbingly wise. When her character is made to recount her entire ordeal, how she was diagnosed and how she came this close to death and how she somehow hung on because of a miracle, Woodley miraculously circumvents the mawkish phoniness of the word "miracle". She just, like, says it. People keep telling her it's a miracle and so, hey, what the heck. She comes across entirely free of the forced sentiment that is often a fatal affliction of this genre, affording her character no false hope, having long ago accepted what's in front of her, more so even than her parents who dutifully fight through an unwinnable situation while putting on a happy face. She doesn't put on a happy face (even if facially, she does). She simply finds a way to be happy while still accepting the sadness within and all around her. 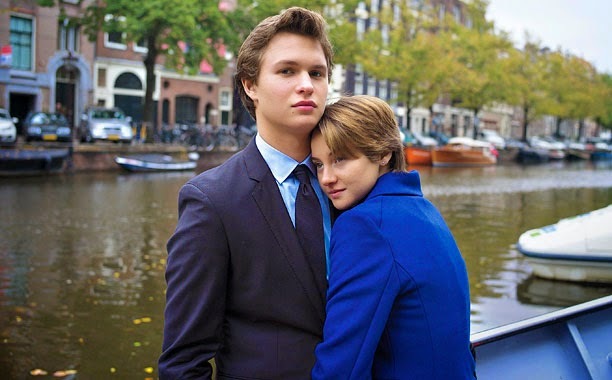 I know a lot of people think TFIOS is just another YA film, but I felt like the actors (and event the writing, thanks to the source material) rose above the typical YA-style. Great review here, Nick! Thanks, Kristin. There are definitely YA tropes present but they turn those tropes into something real. They really do. Glad I saw it.